GEL Engineering provides a comprehensive list surveying deliverables. At GEL Engineering, we understand that you need to complete your project without delay or improve your facility without interruption. Great construction support services guide property and business owners to successful solutions quickly and cost-effectively—and that’s what GEL Engineering does. We integrate planning, surveying, design, environmental and construction oversight services, offering our clients a one-of-a-kind breadth of capabilities, talent and experience. We keep your projects on schedule and on budget—allowing you to do what you do best. Our responsiveness and passion for superior customer service set us apart, as does our 30-year track record of solving problems for our clients and delivering innovative, accurate, high-quality solutions. GEL Engineering can provide surveys according to standards adopted by the American Land Title Association and the American Congress for Survey Mapping. GEL Engineering provides boundary surveys used to establish or create a boundary line between two or more parcels or lots of land. GEL Engineering’s survey group has a combined 65 years of experience in boundary work. GEL Engineering provides topographic surveys that capture the physical features of the earth, as well as the elevations of the subject property that are typically used for planning and engineering. With multiple crews, GEL Engineering can provide this data for large and small parcels in a short period of time. Surveying with the help of Global Positioning System allows GEL Engineering to survey on the National Geodetic or State Geodetic Coordinate grid. In some instances, GPS eliminates the need for traditional line of site surveying saving clients time and money. GEL Engineering provides construction stakeout surveys and layouts of the existing conditions of the future work site, including topography, existing buildings and utilities. From construction project control to building layout, GEL Engineering’s surveys help guide the construction of new projects and keep projects on schedule. GEL Engineering can provide FEMA elevation certificates for clients prior to development to assist, municipalities, land owners, banks and insurance companies to make decisions concerning flood prone areas. The surveyors at GEL Engineering are experienced with these issues and can answer the many questions associated with issues that relate to floods and flood zones. GEL Engineering has worked with aerial mapping firms and industries to provide ground control for aerial surveying of large areas. 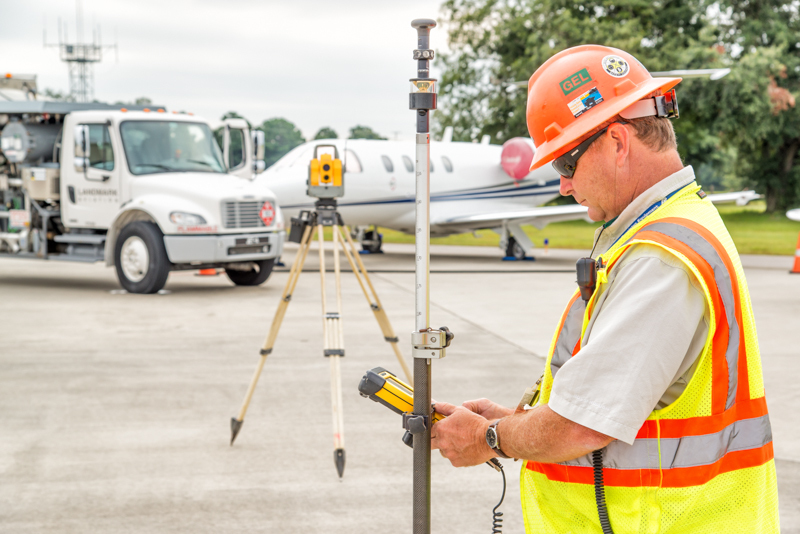 Our surveyors use GPS to set the control that is used to align aerial photography and LiDAR. GEL Engineering provides Geographic Information System (GIS) mapping to help clients organize large amounts of data. GEL Engineering is equipped with GPS units that capture data that can then be imported into GIS software used to compile large databases. Similar to topographic surveys, GEL Engineering provides route surveys consisting of surveys along right of wayfor the use in planning and engineering. With multiple crews, we are equipped to provide this data for large and small parcels in a short period of time. GEL Engineering frequently performs surveys on plant sites and industrial areas that have to be performed carefully with considerations for site rules and regulations and how they apply to safety. GEL Engineering surveyors are 40-Hour HAZWOPER trained in order to work safety on an industrial site. Counties and municipalities often have tree ordinances that stipulate how to preform site work around existing tree resources. GEL Engineering provides tree surveys to identify size, species, condition and location of trees on a parcel of land. This information is critical to project planning and engineering to ensure the protection of trees. Beach renourishment surveys are used to map the dynamic process of erosion or accretion of sand on our beaches. GEL Engineering provides land-based surveys along with hydrographic surveys to develop maps associated with beach renourishment projects and studies. GEL Engineering provides elevations used to determine the vertical movement of foundations or structures over time. Volume surveys are primarily used to measure the quantity of materials that have been moved on a site or stored on a project. The material may include soil, stone, coal, agricultural products, silt and others. In many cases, these numbers are used to determine a basis for payment. GEL Engineering has provided volume surveys for numerous projects including remediated sites. A wetland surveyisprovided to determine the agreed upon limits of the U.S. Army Corps of Engineers jurisdictional areas considered protected as wetlands of the United States. These surveys are used for site planning and engineering and are a basis for permitting applications and mitigation of these protected areas. GEL Engineering surveyors flag the location of potential wetlands and provides this information to clients. GEL Engineering provides hydrographic surveys of water bodies including coastal waters, inlets, rivers, canals, lakes, and ponds. Hydrographic surveys collect information about these bodies of water. GEL Engineering deploys equipment onboard our own vessels to collect data for the use in determining the depth of water, condition of navigation routes, dredge volumes and beach profiles. Proper tools and technology. At GEL Engineering, we use our own equipment to survey, chart and model for our clients, including LIDAR, bathymetric technology and side-scan sonar. Our mapping systems include AutoCAD, Terramodel, TRITON, CARIS and ARC/INFO, and GPS technology. We use our hydrographic surveying vessels and equipment Trimble Ag132 Differential GPS, Innerspace 456 dual-frequency Depth Sounder, and Hypack MAX Software to perform pre- and post-dredge hydrographic surveys for industrial facilities and marinas. GEL Engineering can compute both allowable and removed volumes from the data obtained during the survey. We plot the results in drawings using appropriate local datum and correct the vertical soundings to Mean Low Water. Professionals that go the extra mile. Our highly skilled Professional Land Surveyors have the experience and technical knowledge to provide value to our clients. They work safely in difficult conditions and have built a reputation for collecting accurate data under all conditions. Contact us to learn more about our surveying services.